Trooper Frank Doris was shot and killed during a traffic stop. Trooper Doris had just finished his night shift working the desk at District 12 Headquarters. He was on his way home to Clay City when he pulled over a bright red Mustang for speeding on Route 45 near Flora. As he sat in his squad car issuing a ticket, Trooper Frank Doris was shot in the head by the speeder, who then fled. A reflex made the slain trooper's foot press against the accelerator, causing the car to overheat. Nearby residents pulled Trooper Doris' body from the car just before it burst into flames. He was taken to Clay County Hospital where he was pronounced dead on arrival. Troopers quickly located the assailant, a 60-year-old ex-convict, who led officers on a three-county chase with speeds reaching as high as 130 mph. Troopers were able to box in and apprehend the killer near Albion in Edwards County. In the car, they found Trooper Doris' ticket book and a .38 caliber revolver that was used as the murder weapon. The killer was charged with murder. He was subsequently found guilty and died in prison while serving his sentence. 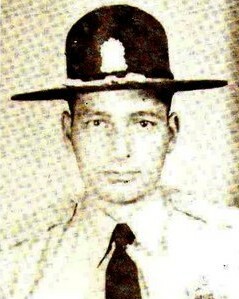 Trooper Frank Doris was a 10-year veteran of the Illinois State Police - District 12, Effingham. 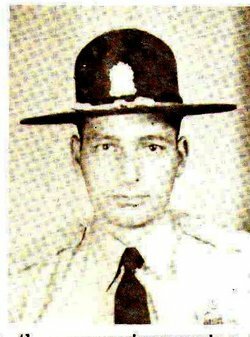 He was also a World War II veteran and a local businessman before joining the Illinois State Police. He was survived by his wife and three sons. I have been driving up I -57 for 3 years. I just read this story about Trooper Doris. What a horrible tragedy. My heartfelt condolences are with all family members.